(CNN) — The leaders of North and South Korea held a surprise meeting Saturday, their second in a month, two days after President Donald Trump abruptly canceled a summit meeting with North Korean dictator Kim Jong Un. 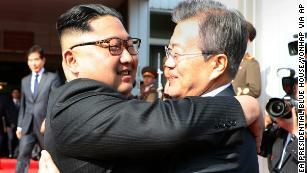 Kim and South Korean President Moon Jae-in met for two hours at the Demilitarized Zone, the South Korean presidency said in a statement. The two “exchanged their opinions” on among other things successfully carrying out a future US-North Korea summit, according to the statement. On Thursday, Trump called off a June 12 summit with Kim in Singapore but then told reporters Friday he’s still open to a conference. 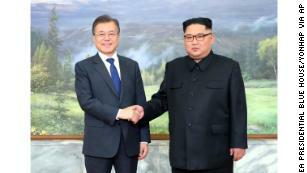 Moon will announce the result of his meeting with Kim on Sunday morning local time, the South Korean statement said. In a tweet Friday, Trump maintained “very productive talks” were continuing on the North Korean summit. “We are having very productive talks with North Korea about reinstating the Summit which, if it does happen, will likely remain in Singapore on the same date, June 12th., and, if necessary, will be extended beyond that date,” Trump wrote. Moon, who has been a mediator between Trump and Kim, called an emergency meeting in the middle of the night after Trump called off the June summit in a letter to Kim. In canceling the meeting, Trump cited hostile comments from top North Korean officials as well as concern about the country’s commitment to giving up its nuclear weapons. US officials said the final straw came when a North Korean Foreign Ministry official called Vice President Mike Pence a “political dummy” and hinted that Pyongyang was ready for a “nuclear showdown” should diplomacy fail. Saturday’s meeting at the DMZ followed a daylong summit last month in which Moon and Kim embraced, planted a tree and talked alone for more than 30 minutes. In April, the leaders also signed a declaration that commits the two countries to denuclearization and talks to bring a formal end to the 65-year-old conflict. It was the first time leaders from the two countries had met in 10 years.